Last edited by action on Fri Nov 03, 2017 4:19 pm, edited 1 time in total. Innuendoes wrote: You're hopeless. The information about Antifa comes FROM Antifa! Spread by right wing nutters. Tell you what, if what you say is going to happen on Saturday happens, I will admit I was wrong. If it doesn't, will you admit you were wrong? Click here to start a protest in your city. Due to permit negotiations, the November 4th demonstration “This Nightmare Must End” The Trump/Pence Regime Must Go!” has been moved from Shoppers’ Plaza to the Parkman Bandstand in the Boston Commons. PDX Refuse Fascism! The Trump/Pence Regime Must Go! OPEN TO EVERYONE THAT AGREES – TRUMP/PENCE MUST GO! IN THE NAME OF HUMANITY–WE REFUSE TO ACCEPT A FASCIST AMERICA! Get in touch to find out about the next organizing meeting. The story of four hundred courageous individuals, Black and white who traveled South in 1961 to challenge the white supremacist Jim Crow laws of the day. ($10.00 suggested donation but no one will be turned away because of financial contraints). Limited seating come early! Can Non-violent Protest, Beginning on Nov 4, End the Trump Nightmare? November 4: CLE Nov 4 : This Nightmare Must End: Trump/Pence Regime Must GO! Cleveland organizing meeting: Make plans for November 4 and beyond and celebrate complete victory for the RNC16 – all charges against the RNC flagburners now dismissed, after a year and a half Municipal Court judge ruled the arrests were unconstitutional iolations of protestors’ First Amendment rights. Don’t forget to RSVP and share the Facebook event page! Wednesday, November 1, 6:30 – 8:30 pm, The LGBT Center, 208 W. 13 St. – Weekly organizing meeting of Refuse Fascism to finalize our plans for Saturday and organize a final push in getting the word out on Thursday and Friday. Everyone is needed tonight, and new volunteers are more than welcome. Interested in volunteering as a marshal on November 4? The Marshals maintain a safe, enjoyable and non-violent environment for everyone in the action. As a Marshal, you will serve as information officer, liaison to medical and legal services and protection of our action. You will be required to attend a training in NYC protest rules and regulations, and non-violent techniques/strategies to identify and to “talk down” disruptive elements without police involvement.Come to the LGBT Center, 208 W. 13 St., tonight 11/1 from 7 – 9pm for training. Please email nyc@refusefascism.org or call 646-851-6785 to register. Thursday, November 2, 3 – 7pm, Union Square outreach. Join us as we set up in Union Square with massive panels indicting the Trump/Pence regime, bringing out the word to everyone that on November 4, we begin. From the park, we’ll be going onto the train cars getting out thousands of palm cards announcing our plan. Come out and bring friends! Thursday, November 2, 6 – 8pm, Lincoln Center outreach. Meet us by the Lincoln Center Plaza fountain to mass distribute palm cards to crowds of people. We need to bring thousands into the streets on Saturday, and this is our chance to make our demand known to the world. Friday, November 3, 3 – 7pm, Washington Square outreach. On the 4th, we will be marching to Washington Square, and everybody has to know that Trump & Pence must GO. From 3 – 7pm, join us in the park and on the trains, getting out new stickers, palm cards, and posters. Meet us at 3pm near the archway, and link up anytime after work or school. Email nyc@refusefascism.org or call 646-851-6785 with any questions, or to let us know when you’re planning to join. Saturday, November 4, 11 am – Gather at the rally site, 42nd St. & Broadway, on Broadway between 42 St. and 41 St. for organizing marshals, distribution of palm cards with the upcoming two week schedule, fund raising, distribution of placards, distribution of organizing kits, and teams that will enlist people on the spot into this great effort. Join a Street Team–get out palmcards, posters, stickers and sign people up to become organizers for November 4. Volunteers also needed to help take photos and video during outreach. Endorsed by: Daryle Lamonte Jenkins, Aubrie Costello (artist), The D.I.V.A.S Ministry Group, MOVE, Drexel’s Black Action Committee, Indivisible West Jersey, Black Lives Matter Movement, Pa, International Concerned Family and Friends of Mumia Abu Jamal, and Anonymous Northeast Operations Network. Add your organization, group, or congregation as an endorser. We are also looking for musicians and artists–let us know if you are interested. Know Your Rights Training with the ACLU PA TOMORROW . 3-5PM at Liberty Resources [112 N. 8th Street]. The ACLU is hosting a “Know Your Rights” training for anyone participating Trump/Pence Must GO non-violent actions being organized by Refuse Facism starting November 4th. Drexel University #Nov4ItBegins Organizing Meeting. Monday at 7pm [Hagerty Library Rm. L-14]. Drexel’s Black Action Committee and Refuse Fascism Philly are joining up to host an organizing meeting for the actions beginning November 4th. Come get involved and join in the discussion on how we can galvanize students for the movement to drive Trump and Pence and all of these fascists out of power. Students from other campuses welcome!! Trump/Pence is a Nightmare! Can we Really drive them out? Wednesday at 5:30 at Germantown Espresso Bar. Dig into this question and gear up for November 4th in Philly at Thomas Paine Plaza (2pm) in Center City! Get in touch to learn more and to find out about the next organizing meeting. Come to the next Nov. 4 organizing meeting! We have announced to the world, (and put out a flyer!) calling for Nov. 4 in this area at Union Square, in San Francisco, at 3 p.m.! Now we have to make this an important contribution to a powerful beginning across the country! This is the question we confront and what our meeting is about. The entrance is through a metal gate on the Republican Street side. Light rail: 3 blocks north of Capitol Hill Station. Parking is difficult, it’s Capitol Hill, but there is a pay lot across the street at Broadway Market. IMPORTANT NOTE: If this is your first Refuse Fascism meeting, we require that you arrive on time for a short orientation. For privacy reasons, we don’t allow new participants in after 6:45pm. Tuesday, Oct 31: University of Washington Outreach with Indictment Panel Installation and Handmaid’s costumes, 11:30 am Meet at By George cafe off of Red Square. Light rail: 3 blocks north of Capitol Hill Station. Thursday, Nov 2: University of Washington Outreach with Indictment Panel Installation and Handmaids costumes, 11:30 am Meet at By George cafe off of Red Square. No, I don't disagree. 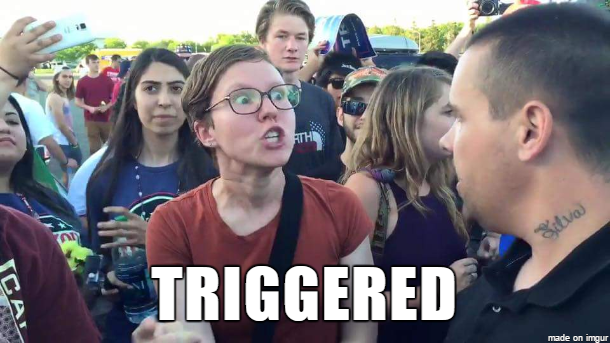 You're an SJW. No, I'm afraid you're wrong, there, too. They really are the fascists, here. Overthrowing or attempting to overthrow the government, here, is treason. Murder is just that - murder. No further explanation for that one. And that's what they say they will do. Whether or not any of them will succeed remains to be seen. I do expect massive rioting if nothing else. Are you opposed to social justice? What is it about equality that offends you so much? Remind me again why you love the Second Amendment? do you want to be likened to those morons? Oh right. I must be mistaken then - can you help me understand please? What does SJW stand for? See, action. He doesn't believe these kinds of people exist.Here's a few of those people. Maybe he will understand, now. Maybe he even likes them? MAYBE, he even acts like this, too? Innuendoes wrote: See, action. He doesn't believe these kinds of people exist.Here's a few of those people. Maybe he will understand, now. Maybe he even likes them? MAYBE, he even acts like this, too? What does SJW stand for?